In his influential 1982 book Megatrends, author John Naisbitt observed that “whenever new technology is introduced into society, there must be a counterbalancing human response, or the technology is rejected.” The very human and innovative nature of 21st century synthesizer-based music is a real-world example of Naisbitt’s observations in action. A local group of musicians has focused on the nexus where music and technology intersect, creating the Asheville Electro Music Festival to showcase local and international music. The Festival took place May 6 and 7 in Black Mountain, NC. “It all grew out of the internet-based electro music community, people who wanted the opportunity to get together and share their musical ideas and expressions,” says event organizer Greg Waltzer. The event started in Philadelphia and eventually moved to New York. After Waltzer and his wife moved to Asheville, they decided to start a similar event in 2012, initially called Mountain Skies. “There’s a great artistic community here, and there are a lot of creative people,” Waltzer says. Plus, Asheville was already a popular vacation destination for many of his musical friends. The festival lineup does emphasize accessibility. “It’s engaging music that’s innovative at he same time,” Waltzer says. 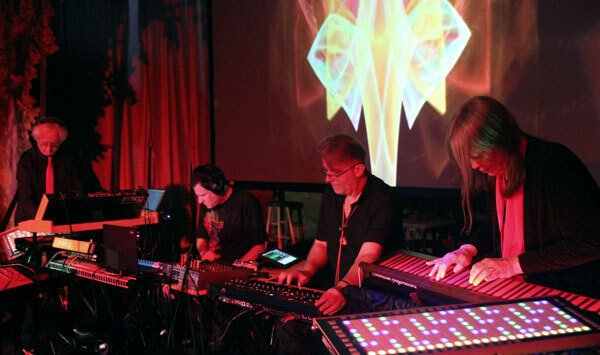 The festival encompasses electro-acoustic and electronic music, which means attendees will see and hear performances that employ synthesizers, home-made circuits, wooden flutes, voice, and any number of “found” objects. Trance, ambient, space and electro-pop are just a sampling of the styles showcased at the festival. Performers are primarily drawn from the community that Waltzer has come to know via the electro-music.com website and larger events in New York. About half are local or regional acts. If there’s a common thread among all the performers, Waltzer says it’s “passion for innovative music and expression, for doing something out of the ordinary.” While many acts on the bill have played at previous festivals, Waltzer says that he actively seeks to feature more local acts. From the start, visuals have been a key component of the festival. Waltzer says that the goal is to “create visuals that will complement the music and enhance the experience.” Each of the two days kicks off with a seminar/performance workshop. An edited version of this feature appeared in Mountain Xpress.